Something so inviting...a little chocolate sin never hurt anyone, now did it? Our friend Martha Stewart shares this incredible recipe which I will personally vouch for. When everyone else is bringing apple pie to the holiday bash, this little concoction will earn you rave reviews. The person who brings the apple pie will even be back for seconds. Buon Appetito! Heat the oven to 325 degrees. Place the cream, milk, vanilla seeds and pod, and cinnamon sticks, if using, in a medium saucepan, and bring to a boil. Remove from heat, cover with plastic wrap, and let sit for 30 minutes to infuse flavors. Cut the brioche into 1/4-inch-thick slices. Cut slices into quarters, setting aside the rounded top pieces. Fill a 9-by-12-inch gratin dish or a deep oval roasting dish with the quartered pieces. Return the milk mixture to a boil, remove from heat, and discard vanilla pod and cinnamon sticks. Add chocolate, and whisk until smooth. Combine egg yolks and sugar in a large bowl, and whisk to combine. Pour chocolate mixture very slowly into egg-yolk mixture, whisking constantly, until fully combined. Slowly pour half the chocolate custard over bread, making sure all the bread is soaked. Arrange the reserved bread on top in a decorative pattern, and press firmly so bottom layer of bread absorbs chocolate mixture. Spoon remaining custard over bread until completely covered and all cracks are filled. Place a piece of plastic wrap over the dish; press down to soak bread thoroughly. Remove plastic, wipe edges of the dish with a damp towel, and allow to sit for 30 minutes. Place gratin dish in a larger pan; fill outer pan with hot water halfway up the sides of the gratin dish. Bake until set, about 35 minutes. Cool on a rack for 15 minutes. Whisk the creme fraiche until soft peaks form. Serve pudding warm, garnished with creme fraiche and chocolate shavings. I think I just licked the screen! Mouth is watering in anticipation...me and a chocolate-free day ..not gonna happen! When I am lucky enough to discover a blog and the first post I read is a recipe for Chocolate Bread Pudding, I know I'm in the right place. You just earned yourself your 663 follower! I wonder if they'll ever come up with a scratch-and-sniff screen. If so, I'm bookmarking that post. I swear I will never fit back into the jeans I hate the least. I just gained 5 pounds reading this post. WOW, sounds and looks unbelievably delicious. That looks amazing! And I love Martha and her recipes. :-) She rocks. That looks AH-MAZING. I'm drooling on my keyboard. Hi. its a type of bread that is a bit sweeter than regular french bread, very similar to Challah. Sadist! Chocaholics everywhere should sue! Hmm thinking about making this one for Thanksgiving dessert....thanks! This recipe sounds so delicious! omgggggggg that looks sooo good!!!!!!! OMG! That looks and sounds positively sinful!!!! Bread pudding is one of my absolute favs! That is exactly what I want and don't need but since I want it, I will have it. Mouth water, yup even a little drool! That bread pudding looks sinfully delicious! I wish that I had some right now!! Thanks for sharing! Im making this and no one better try and stop me!! I think you should start posting the nutritional information with your recipes! And the last thing I need to be doing is looking at this at 1:30am. I was only craving sugar until I saw this, and now I must raid the freezer for the last of my Thin Mints stash. Thanks for stopping by and commenting the other day. Hope to see you around more. thank u very much fr ur lovely comments on my blog..they are always threasured alott..
You know what I enjoy? 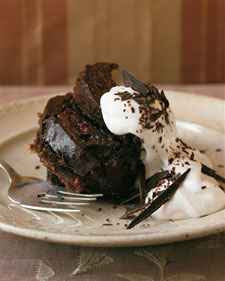 When you share a recipe, it's not just yummy, it's down right decadent! I can feel the sugar/caffeine rush just looking at the photo! I need to lose 15 pounds! Two cups of heavy cream? Oh damn, you went there!! This is NOT going to be good for my diet. Oh well! Whoa... this is dangerously delicious. Crap. I think I gained 5 lbs just looking at this recipe. Yummy in the tummy...I have to admit-chocolate is definitly my weakness! I'm wheat intolerant. You may have just discovered the cure for rice bread. Making this. This weekend. Yum. We are bread pudding fanatics. Yummy I think I will make this tonight!!! I could imagine how the vanilla beans aroma would perfectly compliment a scent of sinfulness. I always feel like I am gaining weight when I visit your blog!